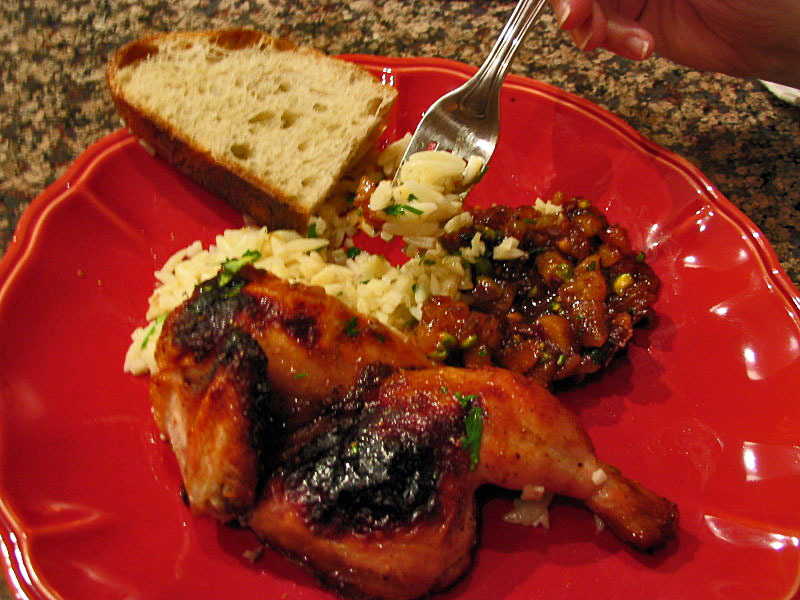 Cornish hens always create a special occasion: they are festive and elegant, but simple to prepare. After a long session of browsing through cookbooks the pistachio dressing in a recipe from Pam Anderson grabbed my attention. Pistachio nuts. I adore them so much that I actually avoid buying them, because after opening the bag with the intention of having just three or four, I usually end up eating them until my fingers are bruised from opening the shells! They are the antithesis of “Everything in moderation”. 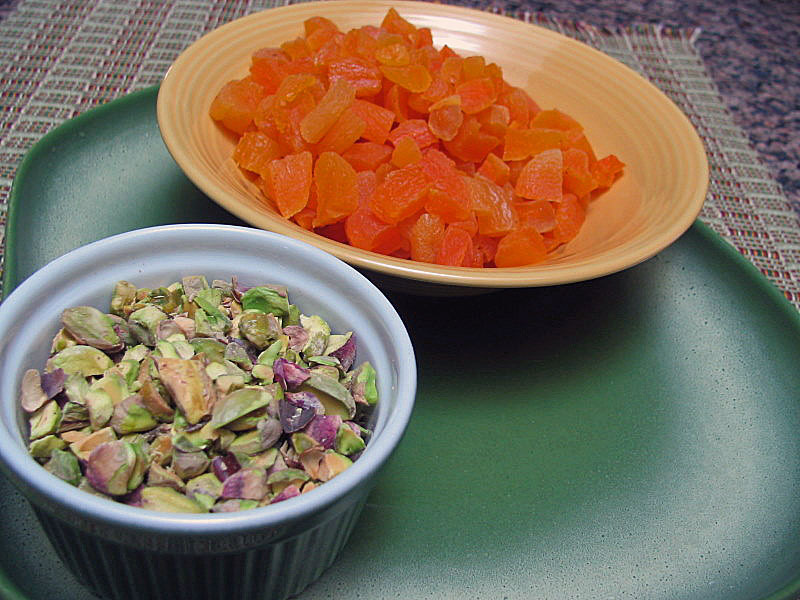 Now, imagine a recipe that pairs pistachio nuts and dried apricots… Irresistible! Butterfly the hens but cutting through the middle of the backbone and removing it. 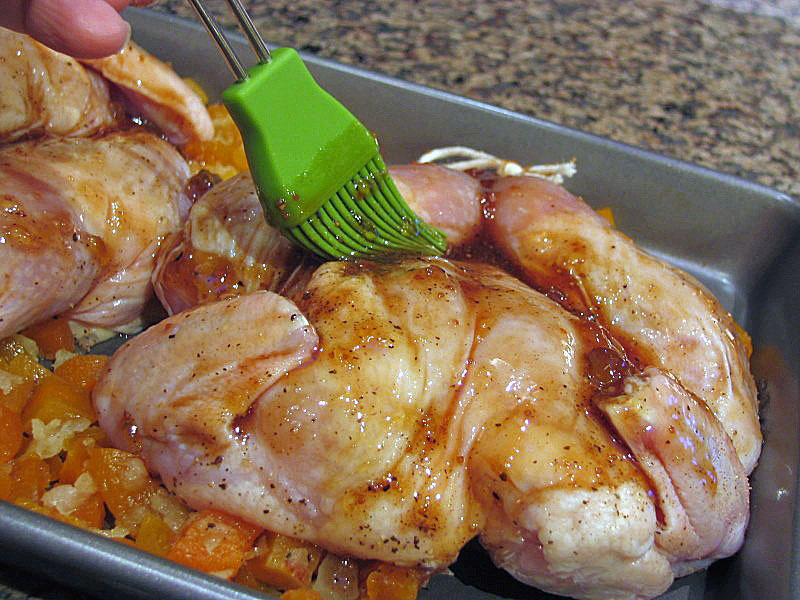 Lay the hens on a cutting board, breast side up, and flatten them using the palm of your hand. Dissolve the kosher salt in 2.5 quarts of cold water to make a brining solution. Brine the birds in the fridge for 1.5 hours. Remove them from the brine, rinse, and dry them. Sautee the onions in oil until very soft. Stir in the apricots, then spread the apricot-onion mixture in a baking dish. Season the hens with black pepper, and lay them on top. You may tie the legs together to keep them in a nice shape. 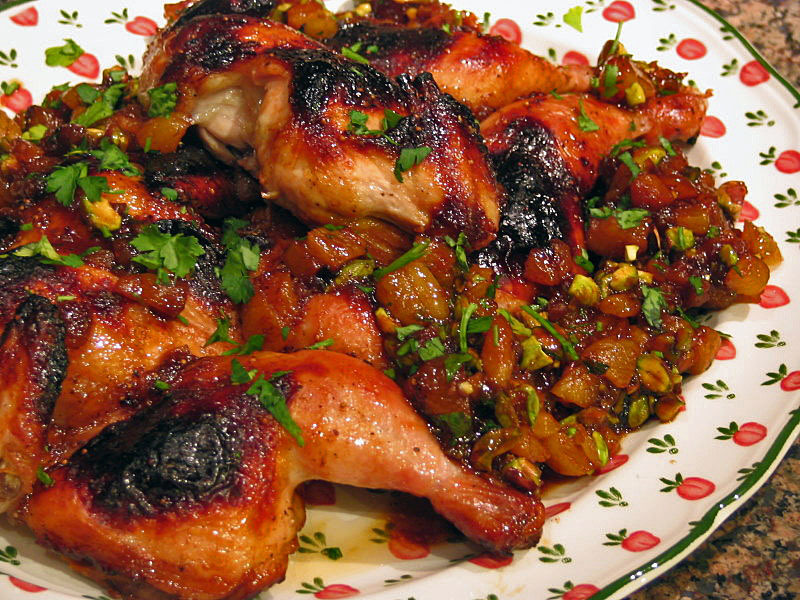 Mix the jam and balsamic vinegar in a small bowl, then brush most of the mixture on the hens. Place them in the oven, add a little water to the baking dish to prevent burning the apricot mixture. Bake for about 45 minutes, brushing with the leftover jam mixture as well as the liquid accumulating in the roasting pan. After 45 minutes turn on the broiler to crisp the skin, but watch closely, because the sugar in the jam will easily burn. 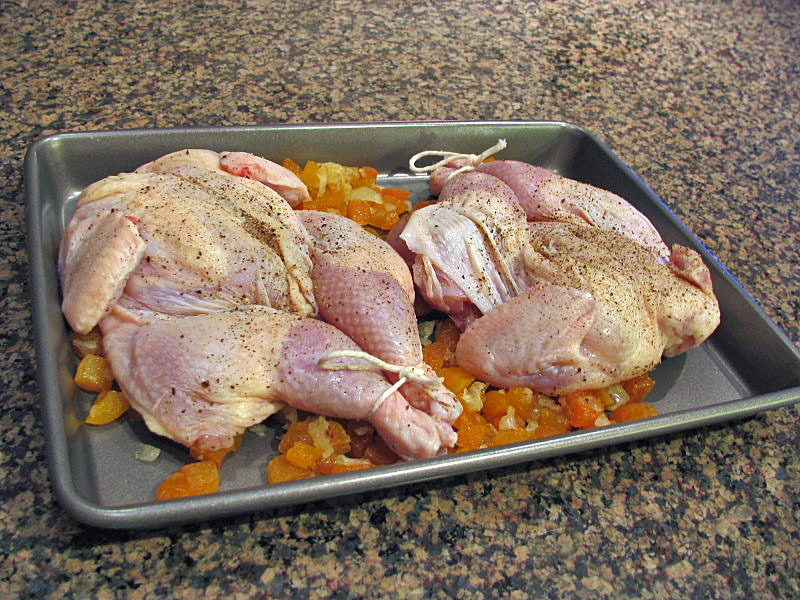 Remove the hens, tent them with aluminum foil, and if you find the apricot mixture too watery, then return it to the oven or transfer it to a pan and reduce it slightly on top of the stove. Stir in the pistachios and parsley, and serve with the hens. Comments: A few weeks ago I bought a pair of kitchen shears, and wish I’d done so long, long ago… Butterflying hens (or chickens) with a chef’s knife has always been too difficult, but my new toy made this step fast and easy. The backbones and wing tips are in the freezer awaiting their opportunity in my next batch of homemade stock. Many side dishes jive with this recipe: mashed potatoes, soft cooked polenta, saffron rice or couscous, but this time I just cooked some orzo, served with a light olive oil and lemon dressing. Homemade crusty potato bread was a perfect complement. Word of caution: the dressing is quite sweet, so go light on the amount you spoon alongside the meat. I intend to play around with the recipe a little, to come up with a slightly less sweet version.